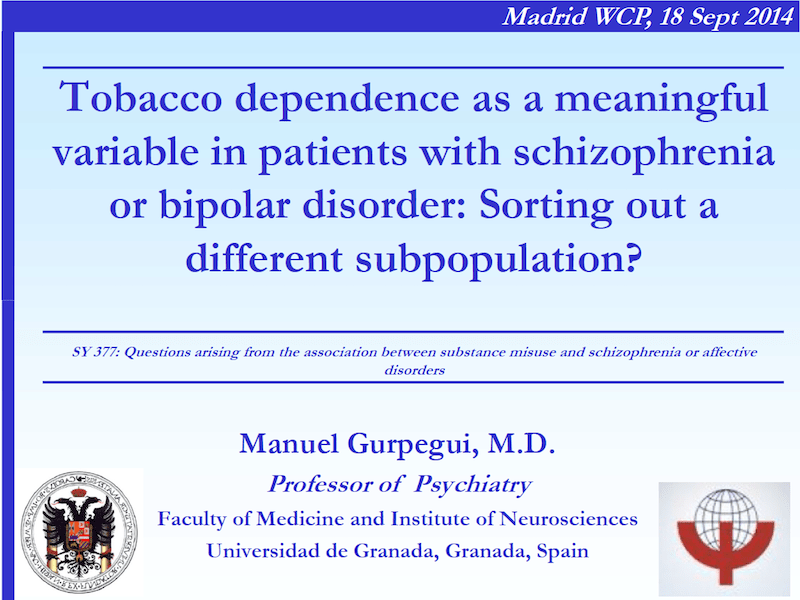 Profesor Manuel Gurpegui |Tobacco dependence as a meaningful variable in patients with schizophrenia or bipolar disorder:Sorting out a different subpopulation? Profesor Manuel Gurpegui: Tobacco dependence as a meaningful variable in patients with schizophrenia or bipolar disorder: Sorting out a different subpopulation?. Lugar y fecha: Madrid, España, 18 de Septiembre del 2014. Ponencia en symposium del XVI World Congress of Psychiatry. Madrid, 14-18 septiembre 2014.